Impressive, concise as well as integrated power point presentation bring out clarity and purpose in the communication. Our presentations have been concise with presentable values, images, videos in order to make it more interesting and interactive. You would never have been to a meeting without being at the receiving end of a PowerPoint presentation. Literally and figuratively, a PowerPoint ends up being the only tool that you can carry with confidence in a meeting and make sure that you have dealt with the issue in detail. How can you turn a project into an interesting brief, a greater proposition and bring life to figures, projections and bland strategies? PowerPoint presentations are a necessity in the official age where you have to convey information in lucid yet summarized manner. PowerPoint presentation is used almost everywhere in the corporate world and have become a tool in the hands of a new age professional. It is this tool that is getting used by CEO’s as well as managers with alacrity. Impressive, concise as well as integrated power point presentation should bring out clarity and purpose in the communication. We believe in providing you that edge whatever be the size of the project. You want a concise project report, a motivational presentation or a strategy session that you would like to share with your employees, we can help create that attractive design as well as content for the presentation. 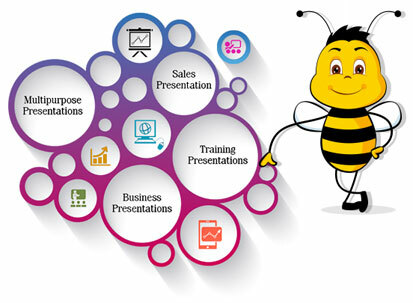 We, at Interactive Bees, understand a dynamically interactive environment needs tools that make life less stressful. Corporates are always time constrained and yet have to communicate every second of their day. 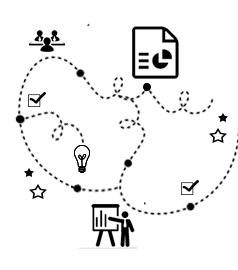 We therefore make presentations that give you an insightful edge in your communication. We use thematic design templates and designs that can complement a presentation.